If you like sweet-shooting .17 HMR rimfire rifles, and appreciate fine German engineering, then you’ll love the Anschutz model 1727. Rarely seen on American shores, this is the only varmint rifle in the world using the super-fast, straight-pull Fortner action. Developed for Olympic Biathlon competitions, the Fortner action can be cycled in the blink of an eye. Just pull back the side-lever with your forefinger and then snick the bolt back with your thumb. This slick-cycling action has been used for many years in biathlon rifles, but the model 1727 is the first example of a Fortner varminter. Our friend Steven Boelter, author of the Rifleman’s Guide to Rimfire Ammunition, has been able to test the Anschutz model 1727 extensively, both from the bench and in the field. Steven has published an outstanding online review of the model 1727, lavishly illustrated with great photos that show all the details of this unique firearm. 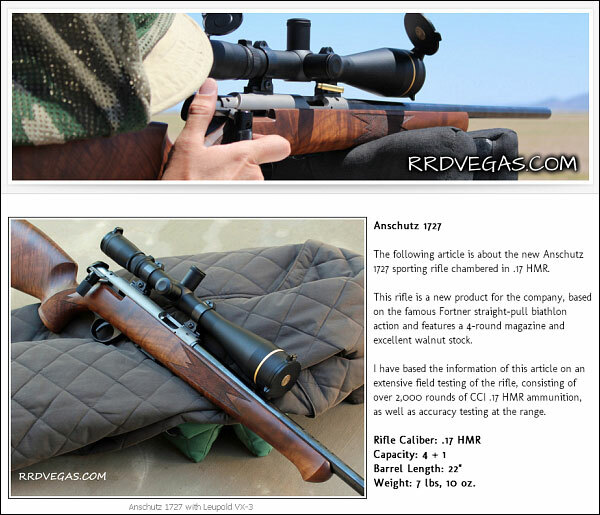 We strongly recommend you visit Boelter’s Rimfire Research & Development Website (RRDVegas.com) and read his Anschutz 1727 Review. The 1727 is truly a masterpiece; there really is no other way to look at it. I can’t think of any other rimfire action which remotely comes close in design or function, and executed at this level of precision. The 1727 combines the accuracy of a single-shot match rifle, provides the convenience of a four-shot repeater, and cycles with nearly the speed of a semi-auto without fear of a dreaded case failure or “Ka-boom”. There’s really nothing else to say about the rifle. With virtually no short-comings in design or function, superb field performance and overall accuracy, it’s to be considered a 10 out of 10. Anschutz 1727 Video Review from Australia. Amazing 50-yd accuracy at 12:00 time-mark. Share the post "Great Review of Straight-Pull Anschutz 1727 by Steven Boelter"
The March edition of Target Shooter Magazine is now available. Content is free — you don’t have to purchase a subscription. This month there are many interesting featured articles, including a lengthy report from SHOT Show, and an article on tuning the 6 PPC by noted gun writer James Mock. Here’s one of the many new products featured in Target Shooter’s SHOT Show Report — a new kind of chronograph. You haven’t seen anything like it before, because it is the first Doppler Radar chronograph for general (civilian) use. Produced in Canada, the new MyLabradar chronograph can be positioned off to the side — the bullet does NOT have to be fired directly over a set of sensors. That’s a big deal — no more risk of killing your chrono when testing ammo. You just aim at the target, with the chrono placed a few yards to the left or right. Share the post "New Products Revealed in Latest Target Shooter Magazine"